ECCIL is pleased to inform you that we are organising a training ‘Communicating Across Cultures’. Join us for an interactive experience in learning about cultural barriers in business communication, ways to tackle them and ways to build your cultural intelligence! In international business, being culturally aware and having the ability to communicate effectively across cultures is essential. A lack of cultural awareness can lead to misunderstandings and problems with colleagues, clients, or bosses – and can deeply affect your organisation’s performance and your own. That makes it a key competency for 21st century employees at all levels. 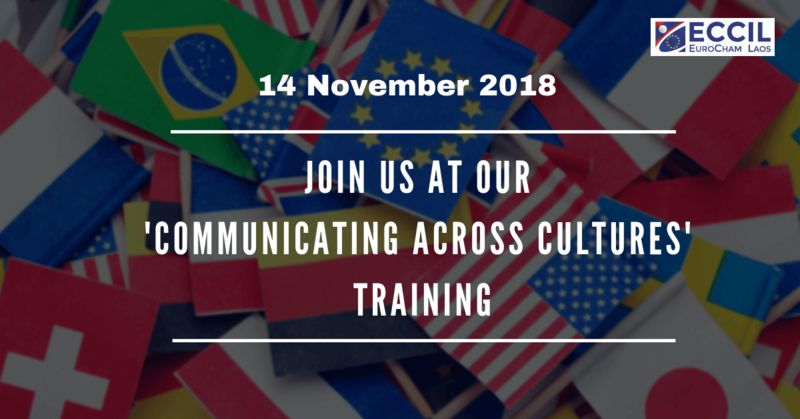 More than teaching you how to communicate with people from a particular culture, this course will provide you with knowledge, skills and tools that will help you to communicate more effectively with people from every cultural background. Anyone who needs to communicate clearly and effectively while working or conducting business with people from cultures other than their own. Tony has spent the last 30 years training business people across the world to communicate more effectively. Tony has worked primarily in Asia, but also in Europe, North America, and Australia, with some of the world’s largest businesses across a range of industries and sectors. Tony’s workshops are engaging, interactive, and fun – and help to deliver real improvement. Please kindly register with us for the training before 15th October 2018. The registration before 1st November will get 10% discount. For more information please email to soupanith.lounalath@eccil.org or sem.eccil@gmail.com , bounta_ctb@hotmail.com or call 021 264330, 020 779 292 73.